With a significantly damaged hull structure following a grounding incident in the Suez Canal, our customer’s 300m, iron ore-carrying cargo ship was unable to continue its journey safely to reach its final destination. Singapore provided the first opportunity to inspect the damage to the hull in detail. The damage was enough to affect the ship’s draft and trim, meaning safe passage to its final destination in China was too hazardous. The ship’s fully laden draft condition also meant that heading to dry-dock for immediate repair was not a viable option. At the earliest opportunity, SeaTec Underwater arrived on site to assess the feasibility of an afloat repair. The key challenge of the project was the extent of the damage, combined with the technical and operational constraints of working at 24m depth. In addition to this, environmental conditions would prove testing, with a combination of strong tides, poor visibility and, at times, a heavy sea state. 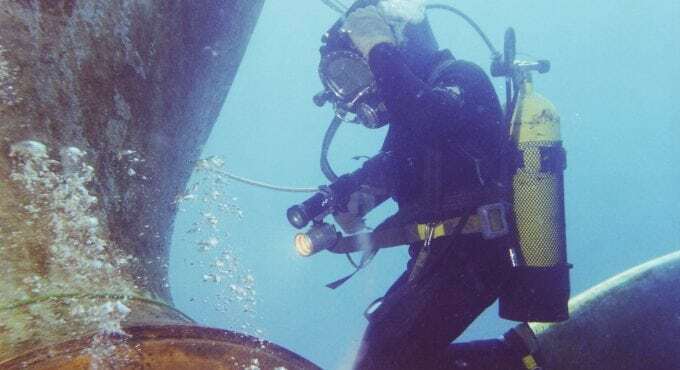 As one of the largest international maintenance providers of high quality underwater repairs, SeaTec Underwater were able to use their team of expert marine technicians and engineers to produce a bespoke repair plan. This involved the design and custom build of two sizeable cofferdams – the largest being 5.5m x 3.5m – which were fabricated by a local shipyard in Bintan. Transported to the ship via a barge, each cofferdam was positioned and held in place with rigging using diver intervention. The cofferdams were then temporarily secured to the hull using underwater welding techniques. This fixing established a ’soft’ seal around the cofferdam gasket, which was followed by a hydrostatic seal after dewatering. This allowed the internal team of engineers to enter the damaged tank areas and perform further repairs and secure the cofferdams to the hull using internal welded bracing. Once completed to the satisfaction of the vessel superintendent, the vessel transited with the cofferdams in place, across the South China Sea to its destination port to discharge its cargo. Using SeaTec Underwater for the successful subsea engineering inspection and repair service of their vessel’s hull, our customer was able to save time and money by avoiding a lengthy cargo transfer and costly delays in dry dock. As the subsea engineers diagnosed the vessel fault quickly and effectively, the design and custom build of the two high quality cofferdams ensured the vessel returned to full operation efficiently and was able to deliver its cargo before the need to dry-dock.